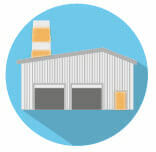 Prefabricated (or pre-engineered) steel buildings are ideally suited for a range of industries and purposes. Whether you’re looking for a temporary or long-term structure, building with steel is quicker and more cost-effective than using a traditional material such as brick. 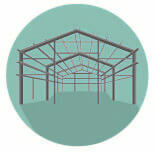 Steel structures are also more resilient against weather, fire and pests. By choosing a prefabricated steel building, you’ll also benefit from the structure being far easier and quicker to erect. This reduced construction period means less hassle for you and your staff. Quality “prefab” steel buildings are often chosen by businesses in need of a modular design; one that can be extended or made smaller if necessary. Many schools, hospitals and laboratories are modular buildings. Pre-fabricated building modules are usually able to be re-sited, which makes them versatile and great value for money too. 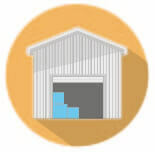 Keep reading to find out more about pre-fabricated steel buildings, or to compare price quotes today, simply complete the form at the top of this page. Comparing quotes with Approved Index is free, quick and easy - and it could save you a great deal on your purchase and construction costs. Cost is an essential consideration for any business owner looking to construct a building - the table below is designed to give very basic insight into the prices likely to be included in the process.